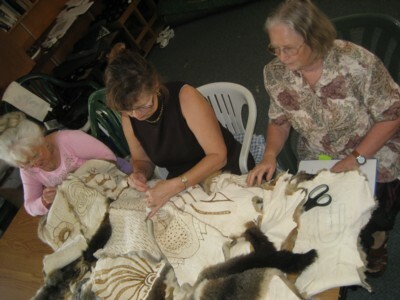 Members of Taungurung Clan participated in the making of a traditional possum skin cloak. The cloak project is sponsored by Monash University's Centre for Australian Indigenous Studies and the finished cloak will be used in ceremonial activities at the University. 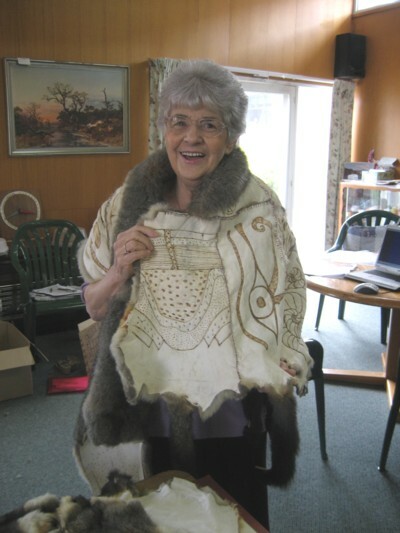 With the ban on obtaining Australian possum pelts, the pelts used in the cloak were obtained from New Zealand where possums threaten the New Zealand indigenous wildlife. Irene Lawrey and others modelled the partially completed cloak for a group of volunteer workers also present at the venue. It was explained that each pelt represents a teaching area of the University. Completed pelts include depiction of pharmacy, geology, archaeology, business, computing, hydrology and neurology. 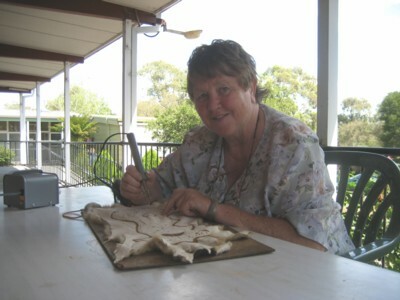 Margaret Martino is shown burning in the design onto the pelt. After first sketching the design using either charcoal or light pencil, the pyrographic burner is used to carefully trace over the design leaving singed lines. 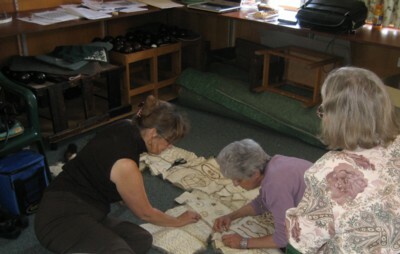 Jean Williamson, Loraine Padgham and Sandra Smith from the Museum Victoria were intensely concentrating on the stitching of the cloak. For this cloak, blanket stitch was selected because it created an interesting definition between pelts.